Interested in continuing your playing career abroad whilst studying in the heart of London? 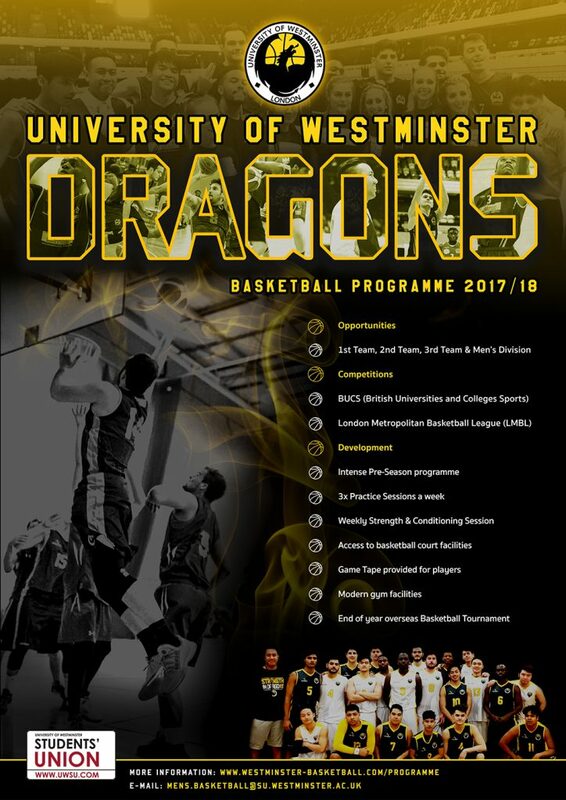 The University of Westminster Men’s Basketball Programme is currently recruiting for student-athletes who are interested in studying a postgraduate degree while still playing basketball at a competitive level. Westminster Dragons Club Team compete in one of the oldest Men’s Leagues in London – LMBL (London Metropolitan Basketball League) Division 2. This provides a extra game or two a week for the students. Why complete a postgraduate at Westminster? There are no restrictions on eligibility of athletes in the UK. US and all international athletes can compete both at club and university level without no issues. Our campuses are based in the heart of London. Dependant on the course, you will be living in the most busiest and diverse city. Captain Lemar bags Quintin Hogg Award at UWSU Sports Ball 2017!